"But the ANOINTING which you have received from him abides in you, and you do not need anyone to teach you; but as the same anointing teachesyou concerning all things, and is true, and is not a lie, as just as it has taught you, you will abide in him." ( 1John 2:27 ). Dear ones, you can understand this only when you experience this incredible promise in your life. We are now living in the last days. If you read II Timothy 3:1-5, we can see clearly how people of the last days are. As the Bible says, this is a terrible and a wicked time. We are pained to see people committing murders and robberies being filled with a love of money and indulging in loveless deeds with haughtiness, so casually. Some people put on the form of godliness and are deceivers. They lie audaciously. We, who are living in such dreadful situations should analyze and see how we should be filled with the divine power of God and live with godly zeal, filled with joy and blessings. Today, many do not realize the truth. They enjoy leading their lives as they like and conclude that such an experience is enough. Many have the wrong idea that it is enough if they eat, clothe themselves nicely and have a place to stay. No, dear ones! Each one of you should realize that you need the anointing of the Lord which the Lord has given us to be delivered and to live a life filled with the Lord’s blessings, without being deceived and cheated. In today’s society, 90% of the people do not have this awareness. The number of people who live in tears in this world increases day by day. Many types of diseases are also on the increase. Don’t many of us suffer from awful things in life such as lack of gift of a child, poverty and so on? 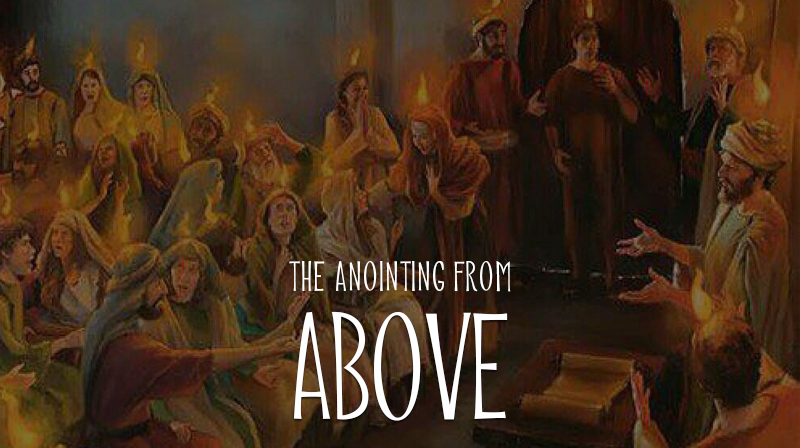 The only way to get delivered is to receive God-given anointing and to abide in Him. Look at the lives of the disciples! They had no care during the days when they were living with the Lord. Jesus always loved them, comforted them, blessed them and led them. So, they were carefree, and His most loved children. However, as Jesus had already told them, one day He died on the cross, rose again on the third day and went back to heaven. They felt lonely and drowned in worries and fears. It was when they were at a loss to know what to do, He spoke to them. ‘He commanded them not to depart from Jerusalem, but to wait for the promise of the Father which He said, "you have heard from Me; for John truly baptized with water, but you shall be baptized with the Holy Spirit…’ (Acts 1:4,5). The disciples who did not know what to do and those who were with the Lord had gathered in a place with one accord in prayer and supplication (Acts 1:14). If you read the next chapter, we could see how wonderful the Lord’s leading was. When they had gathered, the power of the Lord came down. All of them were filled with the anointing of the Spirit. “And they were all filled with the Holy Spirit and began to speak with other tongues, as the Spirit gave them utterance” (Acts 2:4).